One of the great things about the craft beer community is trading. Through BeerAdvocate, a member sent me a 2006 vintage Goose Island Bourbon County stout along with what is called an “extra.” In trading, it is custom to add a surprise extra bottle or two depending on the trade amount, usually something local. 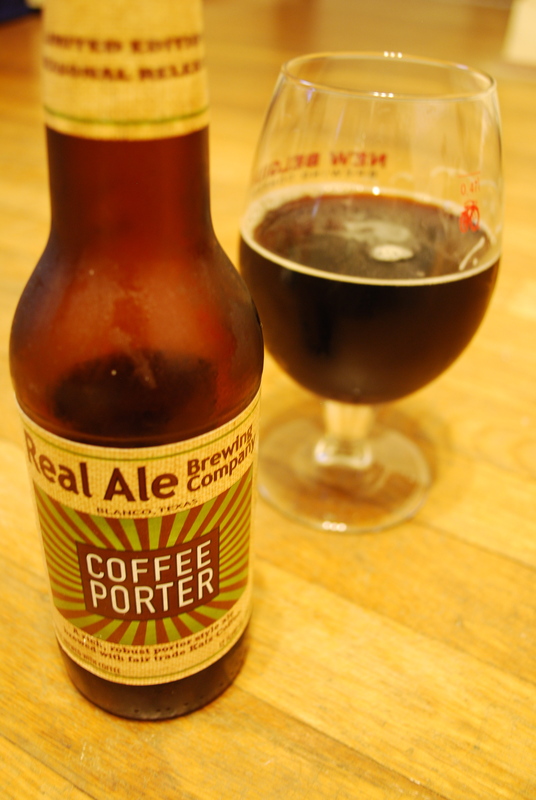 So with the Goose Island, I got this Real Ale Shade Grown Coffee Porter coming out of Texas. Pours a deep brown with hazelnut highlights, with a thin cream colored foam halo. The beer smells of sweet cocoa powder and fresh coffee with a touch of vanilla, oak and sherry. Reminds me of the Aphrodite, possibly the quality coffee from both beers being brewed with fair trade coffee beans. Very light and sweet tasting up front, followed by a rich coffee and roasty malt flavor that fades to a bitter sweet finish. Light, bubbly, medium bodied beer, not as thick as a stout. This beer is really top quality and from a brewery I’d never heard of before. It has everything to love in a porter, it’s sweet, rich, robust roast flavors and a high drinkability without palate fatigue. A really enjoyable beer to drink. I’d save it for after dinner and let it warm a little bit while drinking and it will really open up.